A daredevil pilot had just flown upside down under the Veterans Memorial Bridge across the Missouri River at Mandan. It was the 1930s and the pilot was "Upside Down" Johnny Osterhouse. He could go on to become a well-known stunt pilot and parachute jumper who eventually flew with the Hell Divers Air Circus. Among the elite in early aviation, he had regular contact with Charles Lindbergh at air shows throughout the nation. John Henry Osterhouse was born on May 17, 1903 in Cleveland, Ohio. His parents Henry John and Hannah Madaline (Gram) Osterhouse immigrated to the USA from Holland with the surname Oosterhuis. The family, including two brothers and a sister, moved to a homestead in Hettinger County north of Regent, ND in 1918. As a senior at Regent High, Osterhouse and his teammates won the Southwest District Basketball Championship. He would graduate from Regent High School in 1924. "Johnny� as he became affectionately known, began his career on a farm west of town. He supplemented his income by working at Pechtl-Bowers-Gardner Company Garage in New England, ND where he spent his free time experimenting with automobiles and driving racing cars for Martin Schow of Regent on the state's county fair circuit. In January 1927, the same year as Charles Lindberg�s transatlantic flight, Johnny Osterhouse assisted Martin Schow in building an open cockpit biplane at Stanton using parts from a busted up Travel-Air plane. Schow named the plane the Sakakawea and taught himself to fly with it. When Schow took up flying, John became his co-pilot and mechanic. 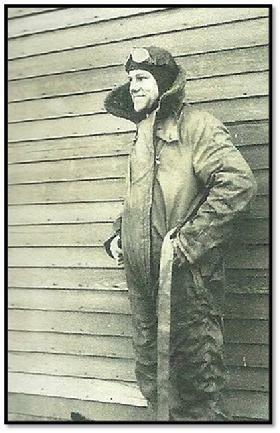 By 1929, Osterhouse was a proficient pilot himself. During the summer months he has made weekly trips to Regent with the Schow plane to give flying lessons to a class of local students. Osterhouse was Mandan's first airport manager. When the position was created in 1929, aircraft were using various pastures around the city as its landing field. In 1933, the city purchased its first dedicated airport property on the south side of "the Strip." By 1934, improvements were sufficient for its designation by the US Department of Commerce as a commercial airport. During his five year tenure as airport manager, he instructed many new pilots and gave rides to hundreds of area citizens who were eager for their first ride in the sky. During the time Osterhouse was managing Mandan's Eielson Airfield, he made an outstanding showing at the Glasgow, MT air races. He tied with the current world's champion Tex Rankin in doing twenty-two outward aerial loops in five minutes. In 1935, while piloting a chartered flight from Golden Valley, he noted the plane's landing gear had broke. Osterhouse told his six passengers of the mishap. He flew back over the Golden Valley airport, dropped a note tied to a wrench instructing attendants to call Mandan to have an ambulance and fire truck waiting. When Johnny circled his plane at Mandan, a courageous student of Osterhouse’s, J.D. Wilson crept out on the wing, caught the landing gear with safety belts, and held it in place during the landing. Osterhouse managed a two-point landing and as the plane skidded on the ground, it tilted slightly on one wing and did a half ground loop landing in a cloud of dust. Much to Johnny’s credit, the tense drama ended in a safe landing. Osterhouse started building and racing professional race cars. He was the first North Dakotan to particpate in the Indianapolis 500. In 1934, he competed in a 1933 Hudson purchased from the nationally known Al Miller who placed seventh in the prior year's event with that car. Unfortunately, Osterhouse did not do well enough in the qualifying rounds to make it to the main event. Osterhouse did better in racing on the North Dakota fair circuit. He set the state's car racing record in 1934. His winning car had a French airplane engine from WWI. At this time, twenty-seven-year old Osterhouse was also visiting his Regent school sweetheart, Mildred Lane, who was teaching school at Sharon, ND. On August 21, 1935, Johnny Osterhouse married Mildred Genevieve Lane. 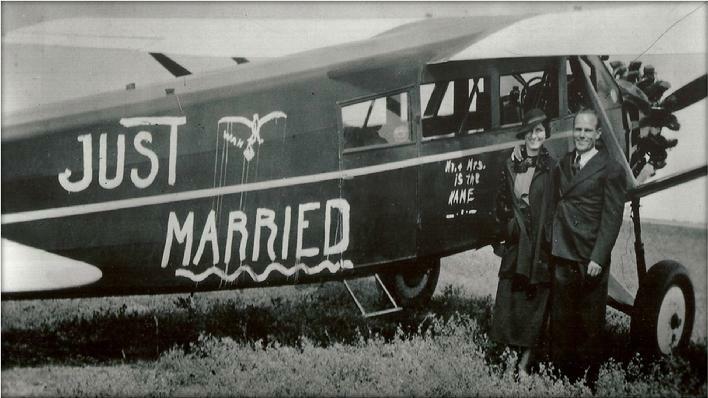 They eloped in his airplane to Lakota, ND. Dr. Ashley, a former pastor of Regent�s Congregational Church, married them. Mildred was the daughter of Lansford and Rosa (Leavitt) Lane, of Regent. She was born August 6, 1908 at Dickinson, ND. Her father homesteaded at Regent around 1908, worked as a cashier in the First State Bank of Regent in the 1920s, and ran a Regent grocery store in the 1930s. Mildred, a teacher, was elected Hettinger County Superintendent of Schools. Osterhouse resigned as Mandan's airport manager to join his new wife in Mott. The young couple made their home in an apartment over the Mott Supply Store on Main Street. The couple had one son, Jack, born on July 8, 1936. 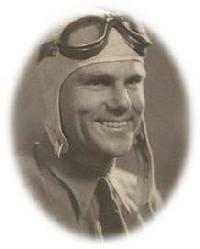 Osterhouse was considered one of the most skillful pilots in the barn storming business. 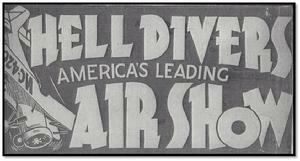 Times were tough financially during the Dirty Thirties, so in November 1935, Johnny Osterhouse and his friend and mechanic for five years, Archie Giesser, of Dickinson traveled to Corpus Christi, Texas, and joined the Hell Divers Air Show. The air show performed throughout the southland during the winter months and further north in the summer. Johnny often introduced the air show by flying his open-cockpit biplane upside down, swooping low in front of the grandstand. He was billed in the newspapers and on brochures as “Upside Down" Johnny Osterhouse. 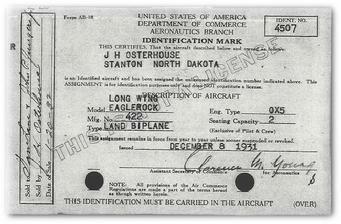 In November 1936, he and Giesser flew home to North Dakota to visit their wives and Johnny’s four month-old son. Regent area farmers, having trouble with coyotes killing their sheep, heard that Johnny was in the area. They asked him to do some aerial coyote hunting for them. Never known to turn down an adventure, Johnny arranged for Archie to pilot and he would do the shooting. The gunner sat up front in the open cockpit for a wide field of vision. (Local aerial coyote hunters acknowledged it was more fun to be the gunner than the pilot while coyote hunting). November 15, 1936 was a cold, crisp fall day. A group would hunt coyotes from the ground, while John Osterhouse and Archie Giesser would shoot them from the air. The ground coyote hunters witnessed the subsequent tragic event. The plane banked at a low altitude and disappeared behind a low hill near Black Butte and crashed. They found Osterhouse still alive in the front cockpit. He suffered a crushed chest after the plane nosed into the ground from an altitude of about 50 feet. He died before a doctor arrived 30 minutes later. Giesser fractured his ankle and lower jaw and suffered facial lacerations. According to Giesser, Osterhouse had just finished shooting and was standing up in the cockpit shortly before it crashed. Ironically, Osterhouse was not piloting the airplane the day he died. The Congregational Church at Regent was too small to accommodate the hundreds of friends that gathered to show their last respects, so the funeral was moved to Regent�s Woodman Hall. At the Regent cemetery, flowers and wreaths dropped from the air onto his casket by aviators. The planes executed roaring power dives as their last salute and farewell to their friend and companion. At least 75 aviators from seven states attended. Despite living only to the age of thirty-three, he had a significant impact in promoting aviation to the region. Described as modest and unassuming but with courage, skill and self-reliance, John made his mark as a successful navigator of the air. The Society wishes to thank Bev Larson Christensen for sharing the material she compiled with the assistance of his son, Jack Osterhouse Rodstrom. Photographs were also provided by Lina Schow Lamsters and Harold and Evelyn (Jungers) Bach.